Guns fell silent on Christmas Eve 1914 on the Belgian Front during World War I. Due to a peculiar string of events, this cease fire is one of the strangest tales to ever occur during this war – or any war for that matter. It’s a story that was kept under wraps for decades, until it wasn’t. 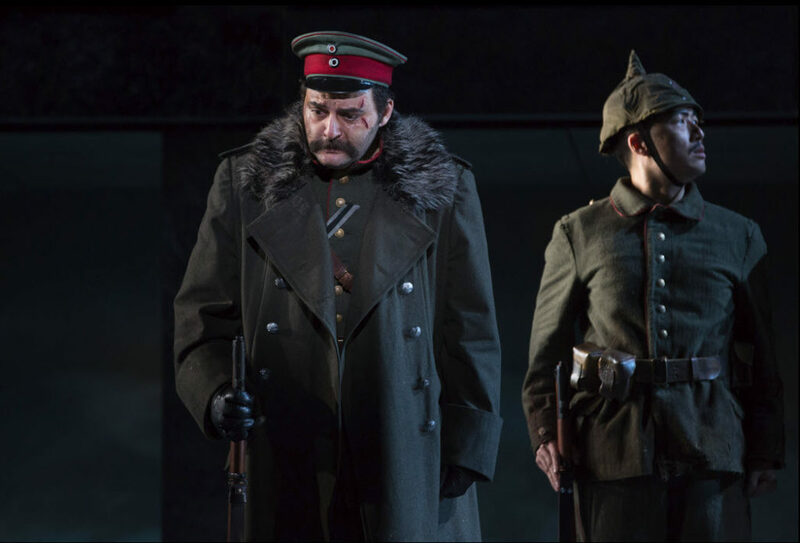 Composer Kevin Puts and Librettist Mark Campbell put us deep in the heart of the fierce battles between the French, German and British (and Scottish) forces and the night they put aside their guns to embrace their humanity, find commonality and discover compassion. 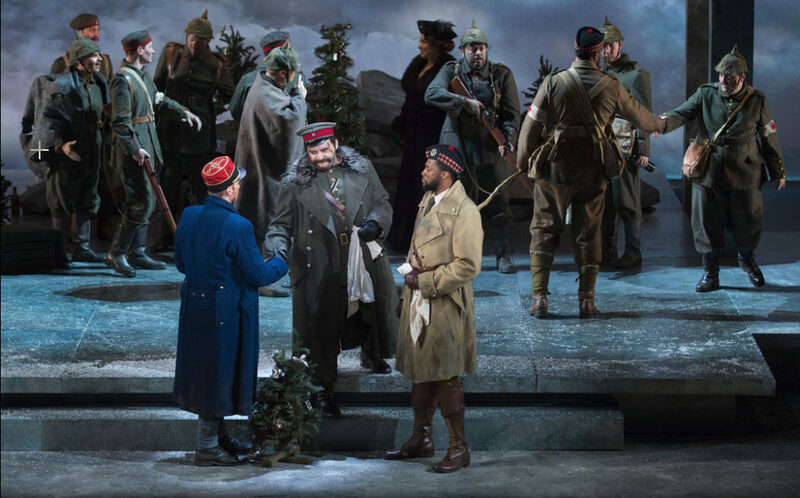 Based on the 2005 film, Joyeux Noël, Silent Night was commissioned by the Minnesota Opera and co-produced by the Opera Company of Philadelphia. 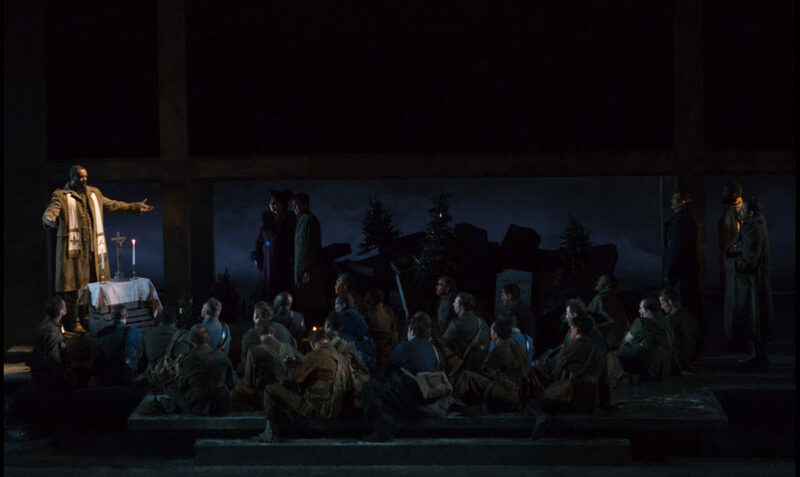 It was first performed in 2011 in Minnesota, going on to be one of the most performed contemporary operas in the U. S. in the past half-century and earning the 2012 Pulitzer Prize for music. The significance of this current production marks the eve of the 100th anniversary of the armistice that ended the war. The reasons for going to war are universal, but at the heart of it all is the killing and the chaos. The soldiers speak of the glory of battle and their future careers, as well as the familiar themes of justice, honor, family, victory and pride of country. It is crushingly familiar. “War is not sustainable when you come to know your enemy as a person. When you see that the person you might be shooting has a child or a wife or has this life at home and they’re just not the enemy, then it becomes very difficult, if not impossible, to sustain war,” said Campbell. Since, surprisingly, I had never seen this masterpiece before, I do not know if it is typically staged in the same way as it is here – on a three-tiered stage with the different countries occupying a different tier – but it is massively impressive and intensely colorful. Striking tableaus like illustrations in a book and soldiers captured in silhouette mark the concatenation of the battles through endless days and fearful nights. But the story is more than battles. It is about the camaraderie of the soldiers, their quest for home and their interconnectedness despite well-defined borders. We discover one of the German soldiers is married to a Frenchwoman and another has fond memories of spending time in the village of his enemy. Harmonics are an outstanding element in this unique opera as it is written polystylistically with influences of Baroque music and the inclusion of bagpipes (over 1,000 bagpipers died in WWI). 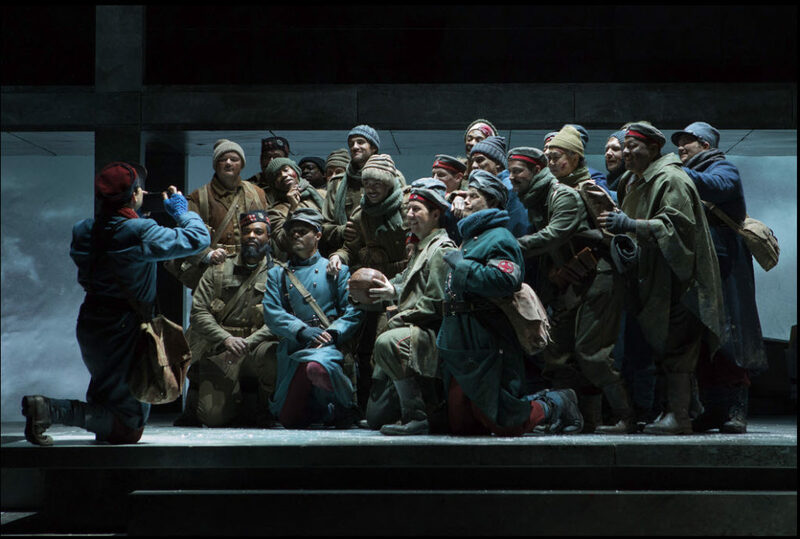 For this production, Artistic Director, Francesca Zambello, has chosen to showcase artists who have been a member of the Domingo-Cafritz Young Artist Program, now in its 17th year. Each cast member has benefitted from this prestigious program and there’s no use in singling out one or two performers out of a 26-member cast who were flawless. 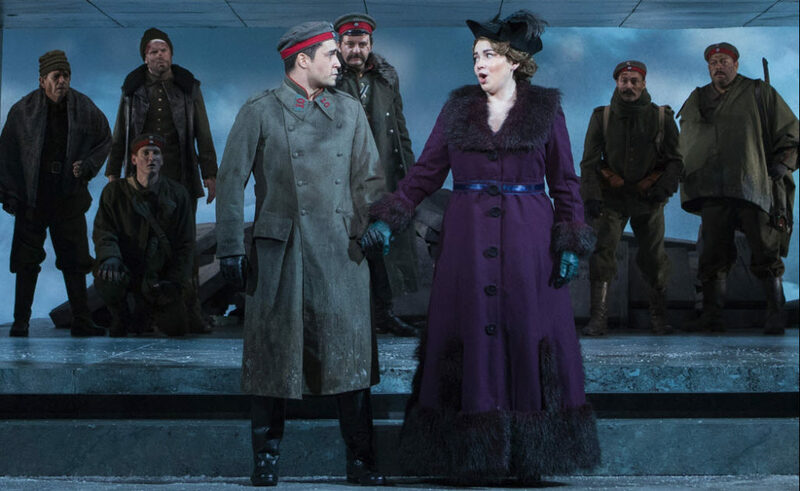 Oh okay, just a few of the principals – Raquel González as Anna Sørensen for her a cappella aria of peace, Alexander McKissick as Nikolaus Sprink for his duet with Anna, and Aleksey Bogdanov as the German General who has a change of heart. Conducted by Nicole Paiement with the Washington National Opera Chorus and the Washington National Opera Orchestra and directed by Tomer Zvulun. Set and Projection Design by Erhard Rom, Costume Design by Victoria (Vita) Tzykun, Lighting Design by Robert Wierzel, Sound Design by Kai Harada and Fight Master Joe Isenberg. Highly recommended for its timely message and glorious production. Through November 25th. Check calendar for performances. At The Kennedy Center for the Performing Arts, 2700 F St., NW, Washington, DC. For tickets and information for future shows call 202 467-4600 or visit www.Kennedy-Center.org.